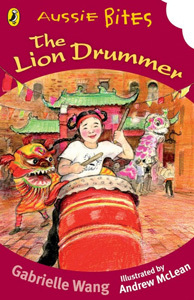 The Lion Drummer is published by Penguin Australia in the Aussie Bite series. “The Lion drummer” is an excellent book. This story is about a girl named Lulu. Lulu has one younger sister named Flora. A baba and a mama which is Chinese for dad and mum. Lulu also has one dream that one day she will become a lion drummer. Lulu wants this more than anything in the world. So one night at dinner she asked her baba. ‘Baba what do you do if you really want to do something that is not the traditional way?’ Lulu’s baba said, ‘First find a good teacher then be a good student. Do you remember the Chinese saying, “A teacher for a day is like a father for life?” Lulu nods and that’s how it happens. Lulu goes to lion drumming lessons every Saturday until …Easter Parade. Lulu dreams that one day she will be the lion drummer in the Chinese dragon parade. Will her dream ever come true? My niece Louisa was the inspiration behind this book. She is studying to be a lion drummer and dancer. In 1978, my mother and my brother went to the old dragon making city of Foshan in China. The dragon they made was the biggest processional dragon in the world: it takes eight people to carry his head alone! They call him The Millennium Dragon. This is the dragon you see marching through the streets of Melbourne. Twice a year during Chinese New Year and Moomba, The Millennium Dragon awakens to the beat of the lion drummer, the dance of the lions and the phut phut phut of firecrackers. Then he parades through the streets of Melbourne. My whole family and many other volunteers come together on these days to help bring the big dragon to life. I never tire of watching and listening to the rhythm of the lion drummer. The beat is so exciting! If you live in Melbourne or are just visiting, come along during the Chinese New Year festival or Moomba and see the lion drummer and the dancers as they accompany The Millennium Dragon through the streets of Chinatown. Moving permanently to a new country is not easy, especially when you can’t speak the language. Not only that, the traditions and customs are so different from your own. All my books deal with the experience of migrant families, and some of the things they come up against while settling into their new home. Not only are there problems for first generation migrant families, but also for their children. These children can have problems of identity and often end up rejecting the language, values and customs of their parents in order to fit in. This is what I did when I was a young girl. The Lion Drummer also deals with tradition and the breaking of tradition. Tradition is good because it keeps a group cohesive but it can also stifle and block the way forward. I have always loved Andrew Mclean’s illustrations and requested him especially for The Lion Drummer. He is an award winning illustrator and you can see why. Andrew draws with such sensitivity – his linework is beautiful and I particularly love the way he draws faces. He has the ability to capture an entire scene in a tiny drawing (page 67). I feel it a great privilege to have him illustrate my story. CLICK HERE to watch a six year old lion drummer!